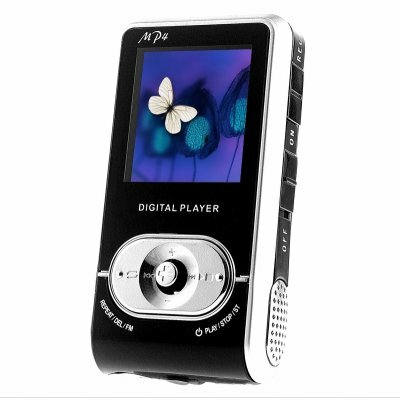 Successfully Added MP4 + MP3 Player with 1.5 Inch TFT Display (2GB) to your Shopping Cart. MP4 + MP3 Player with 1.5 Inch TFT Display (2GB). Classic styled MP4 player for playing movies and music in super high quality on a beautiful 1.5 inch 65k color TFT screen. This classic digital media player features dual earphone jacks and dual speakers for great sound to enjoy for yourself or to share with others. This model also includes an FM tuner with the with the ability to record the music as you listen to it, an E-Book reader, ID3 tags for MP3 files, and more! A great factory direct price means that portable digital entertainment can be yours for a song. Order your personal sample now and then feel free to contact our customer support team to import larger, bulk priced quantities into your country. Bonus: Premium quality gold plated earphones now included! Classic digital media player for video and music files. Portable MP4 + MP3 player with 1.5 inch screen. Click "Add to Cart" now to have us ship this to you today.